The recipe is Gemelli with Shrimp and Sugar Snap Peas, from the June issue of the magazine (online version can be found here). This recipe was one of four recipes printed on detachable cards; this is a monthly feature in the magazine, the recipes on the cards usually tied together thematically. These four were all one-pot recipes. This recipe called out to me because I love shrimp and the other ingredients were really interesting - sugar snap peas, feta and lots of lemon and dill. I decided to make it on a Saturday night, which is when the Bear and I have our standing weekly at-home date, consisting of dinner, dessert, beer and Netflix. I like to cook easy meals on these nights and this seemed like a good one to try out. Most of the ingredients are pantry staples for me. I love feta and usually have some around for topping salads. I buy large bags of frozen peeled, de-veined shrimp at Costco periodically and can usually make three dinners for the two of us from a two-pound bag. The recipe called for fresh dill, which I do not usually keep on hand and the fresh dill in the store seemed a bit wizened when I shopped. I had plenty of dried dill in the spice rack, so I used that instead. I made my own chicken broth, as I usually do, from my favorite Knorr bouillon imported from Mexico (it's cheap and very good). I sliced the snap peas a bit more thinly than the recipe photo shows; I was concerned that they might not be able to cook enough in the allotted time. Surprisingly, the only difficulty with this recipe was the pasta. I checked four different stores and could not find gemelli pasta in any of them. The recipe specified "gemelli or other short pasta," so I took the liberty of using fusilli, which is readily available in all of the same stores and is about the same size and volume as gemelli. I think it worked fine. The recipe technique was interesting. You're cooking the pasta in a combination of water and broth, in much less volume than you'd normally use, and the water absorbs into the pasta as it cooks. Then the peas and shrimp go in, along with lemon juice and zest and some of the feta, making a sauce that clings nicely to all the solid ingredients. I'd never done this with feta before and I was honestly a little skeptical, but I've eaten feta pureed as a dip before and that was very creamy and smooth. The sauce came together really well, thin but silky and very flavorful. I stirred in the dried dill at the very end. I probably could have used more of it, but I was afraid to overpower the other flavors, as sometimes can happen with dried herbs. We ate right away (we're always starving on Saturday nights because we wait until the children have gone to bed so as to enjoy a quiet meal together). It was delicious. The pasta was perfectly cooked, as were the shrimp. The peas were what I'd call just-cooked, and I didn't love that because they seemed a bit tough to me, but the flavor was nice and fresh. There was a definite Greek vibe about this dish, with the lemon, feta and dill. It was easy and very good and I'd make it again for sure. I also tried a crafty project from the June issue, DIY Painted Scarves (you can find the directions online here). The idea behind these scarves is that you make a plain cotton scarf or stole unique by stenciling it with fabric paint. For the past few months I've been sort of obsessed with pale aqua. I've been choosing it for everything lately. I bought a new phone case in this color, a couple of new shirts, a new journaling notebook, yarn! It's just catching my eye all the time. My scarf has a slight white-to-aqua ombre effect. I found it at Jo-Ann Fabrics, where they have a small selection of scarves. I used Tulip Soft Metallics fabric paint in Platinum. I wanted my scarf to be softly embellished, pale and breezy and just faintly blingy. These were the rest of my supplies. I made my own stencil, in the interest of frugality. When I shopped for the type of small, all-over repeat stencils suggested in the tutorial, I found them to be very expensive. There weren't any in the local craft stores I checked, and if I'd ordered them online, the shipping rates were more than the stencil prices. I liked the look of one scarf in the magazine with a dotted design. I thought it would be interesting to have dots going up vertically from the bottom edge of the scarf, almost like bubbles in a glass of soda. I cut a strip of heavy cardboard and punched it full of holes in basically even rows using a standard metal hole-punch tool. I used an old paintbrush on its last legs because I knew I'd need to throw it away after using it for fabric paint. I used an index card to squirt out small drops of paint for dabbing onto the brush, and masking tape to hold the stencil on the fabric as I worked. I covered the kitchen counter, where I worked, with big sheets of white drawing paper taped together. I dabbed the paint on sort of randomly, filling in the holes here and there, as opposed to doing each and every one. I wanted it light and airy, not planned-looking. My stencil worked okay. It got a bit soggy by the time I finished the first scarf-end. If I were doing it again, I'd use a different material for the stencil, probably acetate. After I finished the first end, I hung the scarf on my laundry rack, letting it dry before starting to stencil the other end. The paint bottle says it needed 72 hours to dry, but I'd applied it very thinly and it's so dry here that the paint was quite dry after two or three hours. Dry enough to work with, anyway. It's really hard to photograph. It didn't help that all the photos for this post were taken within a couple of days of receiving my new camera and I was pretty helpless with it at first. But hanging the scarf in the sun helped; backlighting made the stenciling stand out. I like it. I probably won't make any more of them, unless for a special gift, because I tend to buy my scarves in thrift stores (seriously, 25 cents is unbeatable, especially for an accessory that gets practically no wear), but I think this was nice for a special project just for me and I enjoyed making it. Just for you, an awkward selfie in my bedroom mirror! I have a short, hobbit-like torso and I was trying to get a lot of scarf in the photo so I'm a little contorted. I wore the scarf with a white top, khaki capri pants and a light denim jacket. I think it made a nice summery outfit (the jacket wasn't needed for long). The scarf design is subtle, but I know it's there and it shimmers just a little bit, as much as this plain-jane really wants. I've finished half a year of this challenge! I started in January, hoping to enrich my skills. I'd just started my subscription to Martha Stewart Living and really liked what I saw. I'm happy to be doing this self-imposed challenge. I've learned some new things. My recipes and crafts have mostly been successful, but not uniformly so. I'm enjoying it anyway, there's always room in my life for something new, especially in the kitchen and in my crafting. I hope you'll stay tuned for further installments of my challenge. It's not too late to join me! Try something new from any resource (book, magazine, website, etc.) and blog about it at the end of the month. Just leave a link in my comments for us to check it out. I'd love to see the new things you're trying! On our trip to Colorado last week, we took a scenic drive in a northwesterly direction from Colorado Springs, where we stayed for the first two nights. The road took us along the Platte River, which is quite high right now after a wet winter and spring. When it was time to stretch our legs, we stopped near a pretty clearing overlooking a branch of the river. It was a short walk from the roadside down to the water. Fallen trees stretched across the stream and the water was actually fairly deep, but those logs beckoned. The small Bears balanced on the logs and did a pretty good job. Four feet got good and wet but nobody fell in. It was good for them; they don't get a lot of precarious water-play down here in New Mexico. The Bear stayed close by, which allowed me to explore a little. I don't often have much time alone in the outdoors, but it's something I've always enjoyed. We live in the city and I take myself to the park sometimes, but real, honest-to-goodness wilderness isn't a big part of my life anymore. I miss it. This day was a good chance to walk around, get my own feet a little wet and muddy (I had sneakers on), scope out wildflowers and gaze at the trees, staring up into the boughs of old-growth cedars and pines. There were butterflies everywhere, sipping water from the marshy grass, flitting away too quickly for me to photograph them. But I can tell you there were butterflies of nearly every color: white, blue, orange, brown, yellow, red and black. There were bees and dragonflies. It was like a fairy tale forest and with my family busy playing, I had it all to myself. We gathered for lunch after a while, once the small Bears had begun to get clumsy on the logs, their feet soaked and their faces red with the heat. We spread a blanket on the ground under a huge, shady pine and we ate. There were bagels, yogurt cups, bananas and apples, water in Nalgene bottles - a simple meal, easy to pack and transport. Everyone liked it well enough. Then we all lay on the blanket and rested, looking up into the trees, listening to the birds and watching vehicles pass on the road nearby - campers, massive pickup trucks, motorcycles. I almost fell asleep once or twice. It was quiet and peaceful, the air was fresh, scented with pine, and the shade was cool. We're not fancy-vacation people - give us a hike, or a cave tour, or a museum, and we're very happy. That day, it was a meandering drive in the pine forest, with a stop for play and a picnic. It felt relaxed, unhurried, connected to the place we were visiting. To me, that's exactly how vacation should feel. We moved on after a couple of hours. I said goodbye, right out loud, to the wildflowers, the pine cones, the burbling water and the trees. My children gave me a funny look but then they joined in; we were grateful for our time there, so glad we had stopped in the clearing by the side of the road where water glinted through the trees. As you may have guessed, especially if you follow me on Instagram, I'm away from home at the moment. We're on a family vacation in Colorado and I've been taking a break from the computer. While we've been away, I have done almost no crocheting. Mostly, we've been too busy; we're doing things together during the day and by the time the Bear and I settle down to relax in the evenings, I'm just too tired to crochet. We're staying in a Victorian-era house in a old part of Denver; our accommodations are actually an Airbnb rental, the apartment on the second story of the house. This apartment has been fully renovated and is a beautiful, comfortable space, but the weather here has been very hot and when we're here, I'm not really eager to sit with an afghan on my lap. So crocheting has been on the backburner and I've made very little progress on my throw since last week. 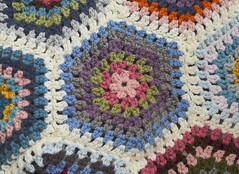 I did, however, have a really interesting crochet-related experience on Sunday morning. I went to a nearby laundromat to wash our rapidly-accumulating pile of clothes and upon walking in, I noticed that two young men were sitting there crocheting while they waited for their laundry! It was exciting. They are a couple and they were making amigurumi animals to give to their dads for Father's Day. They had made a pig and a bluebird; one crochets the bodies and the other makes the small parts like ears, beaks and snouts and sews them on. Their creations were adorable. 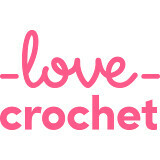 I really enjoy seeing crochet in the wild like that. I haven't been crocheting, but I have been reading a lot on our trip. I picked up the above book, The Phantom of Fifth Avenue by Meryl Gordon, from the library just before we left. I'd previously read another book on the same subject - an heiress named Huguette Clark who inherited vast sums of money from her nineteenth-century copper-baron father and spent the fortune in a spectacular but scandalous way before she died in 2011 - and really enjoyed that, so I wanted to read this one too. I think this one is even better. I enjoy reading about obscenely rich lifestyles; don't judge. Her life is fascinating to read about. I'm especially intrigued by the fact that more than 170 years separated her father's birth and her own death, because she was born to him very late in life and she lived to be over 100 years old herself. Can you imagine? This week, I opened our last jar of plum-apple jam. I made it last summer, with plums from our own trees. We had a bumper crop, and from our three front-yard trees, we must have picked ten pounds during June and July. Some of it became fruit leather, made in our dehydrator. The rest became jam, made with a few store-bought Granny Smith apples because our apples were not ready to pick yet. It was my most successful jam to date, and I was really proud of it. We all worked together to pick the plums, and the Bear and I spent night after night pitting and chopping them, to be stored in big Ziploc bags in the fridge until we had enough for the jam, or the fruit leather. Then I spent a morning in the kitchen making jam with the prepared plums and the apples, and ended up with a lot of it, enough to get us through the next few months, I'd hoped. As it turned out, we made it through almost a full year with this jam. I supplemented here and there with a jar of store-bought jam, mostly for variety. I think I bought three jars over the past year - a raspberry, an apricot and a cherry. We all enjoyed the plum jam, but it seemed okay to mix it up a little now and then. Otherwise, it's been all plum jam, all the time, and it was nice to eat something we'd grown, picked, prepared and preserved, each of us doing something toward the storage of our own produce. I would love to be more self-sufficient. It's not easy to achieve this on a semi-urban fifth-acre lot in the desert. I don't use that as an excuse. I don't necessarily want the labor that would be required to make this little lot work harder for us. I've come a long way, though; if you'd asked me five years ago whether I'd ever want to keep chickens, I'd have laughed in your face. Chickens are dirty and noisy and you can't bond with them, I would have told you with deepest conviction. I knew what I was talking about. I also knew that making jam was frivolous. I've done both now and I realize that I was wrong. And other things too: sewing and crocheting things instead of buying them, composting, upcycling the weirdest old junk. I can do a lot more, but I already feel better about the space I'm taking up. Jam-making, for me, has been an exercise in patience - with the fruit and with myself. Some years, it just won't grow. In others, I'm pelted with plums every time I walk under the trees. Or apples rain onto the roof above our bed all night long, their soft thuds waking me in the wee hours. The apples have been less reliable than the plums, though I can usually bake a couple of pies or crisps each year. Last year, I even tried apple jelly for the first time. It was beautiful when I first made it, but after a month or so in the pantry, the second jar turned funny on me. It was like the world's thickest honey, but not pourable or even spoonable. And it smelled like cheap applejack, which when combined with the texture, made for the world's worst sandwich. I was disappointed. It had seemed so right - the plum jam had worked so well a couple of months before, why was I taking two steps back with this wretched apple jelly? Who knows. Bad apples, maybe. Or not enough juice in the recipe. Or too much sugar, or too much cooking, or not enough pectin. It doesn't matter. I tried it. It didn't work. It's not the end of the world. I'd rather eat plum jam any day. And if I must eat apple jelly, like if I got an overwhelming urge to eat some now, I can buy a jar in the grocery store for something like $1.99. It hasn't happened yet. Two weeks ago, I made my latest jam, tarragon strawberry, and it was a success. I noticed afterward, when the jars had cooled and been put in the pantry, that I hadn't been scared at all while I worked. It all just flowed. I was in a jam zone, like I'd been doing it all my life. But I only tried making jam for the first time two years ago, with my first batch of strawberry jam, which didn't quite set and was probably just barely safe because I knew very little about sterilization or processing. We ate it, and we lived, but there was plenty to learn. - You can sterilize your jars in the oven on a low heat. Just put them on a sheet pan or a stack of newspaper. You can bake your jars at 200 degrees Fahrenheit on top of the Sunday comics and they won't yellow. Your family won't even know you took them before they had a chance to read them. - Fruit is really forgiving. Jam can be made with the ugliest bruised or greenish strawberries and nobody will ever know the difference as long as you use some really nice ones too. - You can use less sugar than the recipe states. For my most recent batch of tarragon strawberry, I halved the recipe, which required 7 cups of sugar in its full form, and only used 3 cups of sugar in the half-recipe. It still worked. Liquid pectin is the bomb. - You can keep your liquid pectin in the pantry for two or three years, even though the package says you should buy a new one every year. I won't tell. - The sound of a jam jar sealing is like angels singing (when you've been feeling particularly unsure of yourself). - Men and children like sugar, a lot. Nothing else matters. This week, I'm continuing to ripple. I've finished the light green section and moved on to a darker one, my fourth color so far. The dark green is Stylecraft Special DK in Khaki (the other colors are Cream, Camel and Meadow). I'm aiming for an earthy look with this blanket. I want to put it on the couch in the living room. The couch is a grayish-green. I have beige and cream cushion covers on the throw pillows. What is your furniture style? Do you like colorful upholstery or basic, plain fabrics? My furniture is relatively boring - basic, sturdy styles; solid, somewhat neutral colors; nothing remotely fancy. It's decent stuff, just not what I'd call stylish. 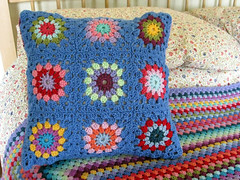 I see crocheted items, and sewn ones, as good opportunities to add color and interest to the furniture, which is why I seem to always be making another throw or afghan. Sometimes I wonder if I should be doing this anymore; where will it end? We have more than enough already, but it's such a pleasure to make them. I like having them around, and the local blanket-fort-makers certainly approve. In the mood for a break from novels featuring murder and mayhem, I'm now reading I Love It When You Talk Retro by Ralph Keyes. This is an interesting book about American speech, the slang and turns of phrase that are part of the way we talk, or have been in the past. There are many words and phrases I've always wondered about. As a relentless committed talker, and as someone who is sort of obsessed with what life was like in the past, I'm really enjoying this book. I finished Where They Found Her by Kimberly McCreight a couple of days ago. It was just okay, in my opinion. There were too many characters to keep track of, each with their own weird personality flaws and too many interconnected stories between the characters, yet the mystery needed more development. Meh. I hope you're all having a lovely week. Thank you for your kind and interesting comments and conversation lately, and welcome new readers and followers. We spent most of today in the backyard, smoking ribs and making homemade French vanilla ice cream for an early Father's Day dinner with the Bear's parents. It was a beautiful day, just this side of too hot, with a mostly-clear sky and a light breeze. We've been having an unusually cool and wet June, to follow an unusually cool and wet May, with the monsoon just around the corner. There have been pop-up storms and showers most days lately, which isn't normal for June at all, it's more of a July-and-August thing. So today felt like a real gift, a whole day without any rain or surprising gusts of wind, a chance to be outdoors doing things we like to do, and some we had to do. The Bear and I weeded the big planter bed; there was a lot of grass coming up toward the back, under the roses and Jupiter's beard where it's shady and stays fairly wet. Grass was coming in thick there, and we ripped out big handfuls. I pruned roses and we watered everything. We put the ribs in the smoker and got the ice cream machine churning, and then we just hung out. We ate lunch (a hodge-podge of leftovers) on the patio, listened to the radio, watched the clouds. I crocheted. We looked for hummingbirds and saw many. We don't have a big backyard, but boy, do we use it up. Our property is about a fifth-acre, a deep but narrow rectangular lot. It's only about as wide as the house, which means we have good-sized front and back yards. We have a little bit of everything in the back: a chicken coop (with two hens), lots of flowers and shrubs, two patios, a swing set, an apple tree. We spend a lot of time out there, in every season. It's quiet and safe; the small Bears can even ride their bikes on the larger of the patios. There are things I would change, and eventually I will change some of them, but the backyard is one of the best things about my house, I think. Later in the afternoon, the Bear's parents came over (they live in our neighborhood during the summer months, when they are not in New Zealand, their permanent home). We visited for a couple of hours while the Bear and I finished cooking our meal. He tended to the ribs outside and I made corn on the cob, baked beans and brown-and-serve dinner rolls. We only make ribs about twice a year; they're a lot of work and obviously not health food, but they are soooo good. The Bear does it all himself, using recipes from a rib expert called Meathead, specifically his Memphis Dust spice rub and Kansas City Classic Barbecue Sauce. We had our homemade ice cream for dessert. My recipe comes from The Best Ice Cream Maker Cookbook Ever (really, it is). I'm particularly proud of that ice cream. I made the custard yesterday morning, to give it time to set up in the fridge. I used our own eggs. I think it's the best ice cream I've ever made. Sometimes my homemade ice cream seems greasy, but this one came out smooth and light. My kids were gross by the end of the day, after playing in the backyard, hanging around a smoker, and slathering themselves in barbecue sauce and ice cream (twice, if you count licking the beaters after churning, and I do). They had baths as soon as possible. They had an extra-long story before bed (the Bear read to them from The Wind in the Willows). They went to bed tired and full. I'm about to do the same, feeling full in every way.